What a terrific invention! Gingerbread Pineapple Upside Down Cake. Delightfully delectable! Hi. It’s Lois at Recipe Idea Shop, telling you about Gingerbread Pineapple Upside Down Cake. 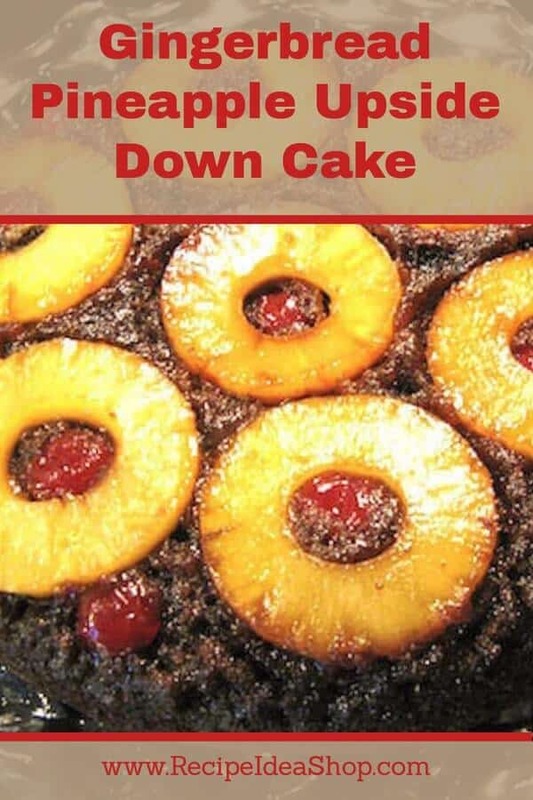 Using gingerbread instead of the traditional yellow cake makes this Pineapple Upside Down Cake very flavorful. And it has become my new favorite birthday cake. Happy birthday to me! We’d like to take credit for coming up with this idea, but we can’t. Some years ago Don and I were at a dinner party in Williamsburg, Virginia, and Pineapple Upside Down Cake was served for dessert. 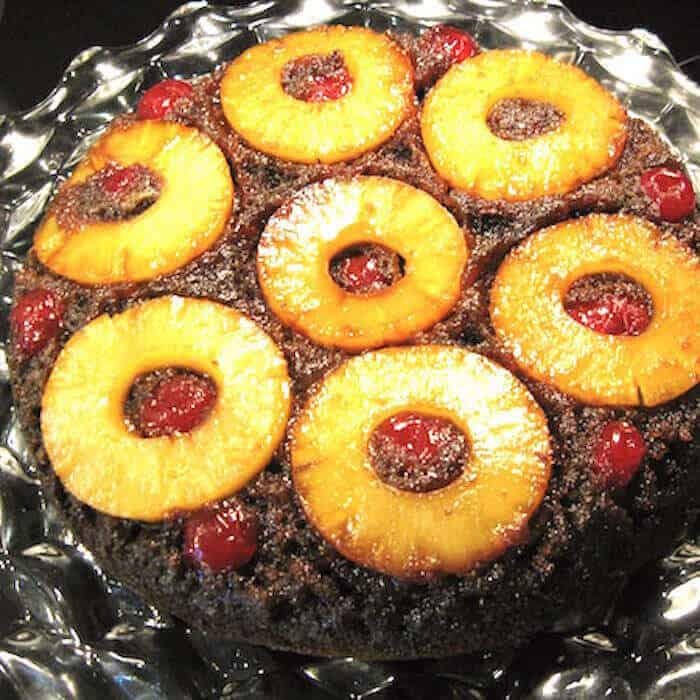 Lucy Grubb, one of the older guests, told of how her mother would make Pineapple Upside Down Cake with gingerbread instead of the traditional yellow cake. We tried it and have been hooked ever since. The gingerbread version is great comfort food for Don because his family often ate gingerbread in the wintertime, but it’s a bit too heavy for the hot days of summer. 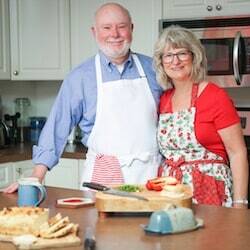 Don makes it the traditional way, in a 10-inch cast iron skillet. To serve, upend the skillet onto a serving platter. Some for the pineapple rings may stay behind, but they are easily lifted from the skillet and placed back on the top of the gingerbread (which, of course, used to be the bottom of the cake until you turn it over). Get Yourself A Set of Cast Iron Skillets: Great Investment! Set of 3 Cast Iron Skillets. Buy yours on Amazon today. You’re gonna wanna eat this cake. Better than Old-Fashioned Pineapple Upside Down Cake. Made with a moist, amazing Gingerbread Cake. Heat the butter in the skillet until it melts. Swirl the skillet to coat part way up the sides. Cover the bottom of the skillet with the brown sugar. Place the pineapple rings over the brown sugar around the edge and one in the center of the skillet. Place a maraschino cherry half in the center of each pineapple ring (all with the round side down) and add more in between the rings if you want. Heat the oven to 350 F degrees. In a separate bowl mix the remaining dry ingredients. Fold the dry ingredients into the liquid mixture. Add the boiling water, mix well and pour it over top of the pineapple rings. Bake for 40-45 minutes or until a toothpick inserted near the center comes out clean. Remove the skillet from the oven and let it rest for a minute, no longer. You may find it helpful to loosen the cake from the outside edge of the pan with a table knife before you do the next step. 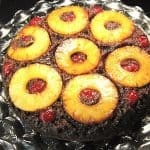 Place the serving platter over the skillet and turn both together upside down to reveal the dark brown gingerbread topped with pineapple rings and cherries. 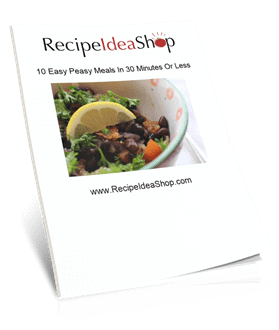 Let cool and serve just how it is or add whipped cream for elegance. Gingerbread Pineapple Upside Down Cake Nutrition Label. Each serving is 1/12 the cake (no whipped cream).